This city has a unique timeless beauty and appeal which attracts a lot of tourists every year and if you want to spend your next vacation here this summer then you are making a great decision! Perth can offer exquisite moments to people who love nightlife, for families with kids who just want to have some fun, for lovers looking for a private escapade and for large groups of friends as well. Especially if you are visiting with your family, it is a good idea to check the Kings Park & Botanic Garden first as this place can offer you amazing natural landscapes to admire. Afterwards, you might want to relax around the Swan River and take stunning photos in this area which will make all your Facebook friends envious. Lastly, don’t forget to visit the Aviation Heritage Museum for a small, but very interesting history lesson. Perth is well-known for being a welcoming city and obviously, you can always find a hotel room here which matches your tastes. For example, if you bring your dog with you, make sure that you are looking for a pet-friendly hotel room. If you want to swim in the morning then there are also a lot of hotels with feature a pool as well. If you prefer quietness then the hotels and apartments at the edge of the city are more suitable for you. During your Perth vacation, it is a brilliant idea to just take your loved ones and find a nearby restaurant in order to enjoy the local appetizing meals. Prices are affordable and if you don’t know any location or restaurant then Darlington Estate Winery is a great place to start. Also, make sure that you take advantage of the wine tours organized specially for you in order to sip from a large variety of delicious wines and combine them with tasty dishes prepared from the freshest ingredients. 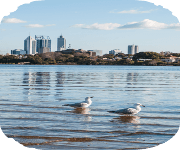 There are Perth tours for all travelling enthusiasts and adventurers, even kayak tours if you want to test your physical skills and enjoy an adrenaline-pumping activity. Similarly, you can travel by foot, by bike or you can rent a minibus or a coach for your own personal travelling needs. In fact, if you are with your family members or a large group of friends, hiring a minibus or a coach is the best way to get around town in a timely and elegant fashion.